We feed the earth and it feeds us. We clear the land and build structures. Time passes, change and decay occur; nature returns. Creative reuse of old materials completes the cycle, saving energy and reducing waste.Abundant Nature provides food and forage for humans and wildlife in a natural system that is easy care and self-supporting. It reflects the canopy layers found in the forest, and weaves urban objects into a magical setting. Welcome the fairies and nature spirits that celebrate their partnership with people sharing mutual respect. The impermanence of our activities results in an imperfect beauty. That is nature! Lovers of sustainable and organic gardening and fans of edible gardens have been talking and writing about our garden, Abundant Nature: An Enchanted Food Forest, for some time now. Below are three reviews of the garden. 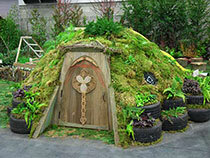 The first is written by Jeanne DeBenedetti Keyes for The Rainy Side Gardener Blog. The second is published on Plant Talk the blog of garden writer Valerie Easton. Last is by Jennifer Davis from the Rainy Day Gardener Blog talking about her favorite parts of the show. Take a few minutes to read one or all of them. You won’t regret it. The logos below can be clicked to go to the websites. 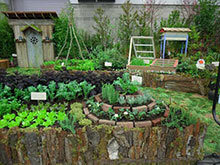 River City Gardens, a small sustainable landscape design company in Portland, Oregon, will help you create a little heaven on earth. 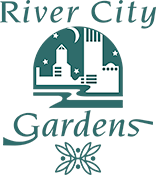 The heart of River City Gardens is Kathryn Leech, APLD, a Certified Landscape Designer with many years experience in all aspects of garden design. ANNIEBAM works collaboratively with clients to create landscape designs that sustain and are resilient. ANNIEBAM guides clients from the conceptual stage to final installation. ANNIEBAM, is a licensed landscape contractor With over 15 years of Landscape design, project management, estimating and installation experience. She’s an Oregon Tilth accredited Landcare Professional. 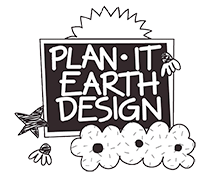 Design With Nature is an ecologically rooted landscape design and consulting practice based in Portland, Oregon, specializing in creating sustainable, edible and nature inspired home gardens. We also collaborate with community groups, providing project management expertise and guidance on grass-roots endeavors to create community gardens, native habitats, rain gardens and nature play areas.